Prototype: Dutch State Railways (NS PTT) class mP 3000 postal system powered rail car and a type Gs boxcar. The train looks as it did around 1977. Road number 3029. 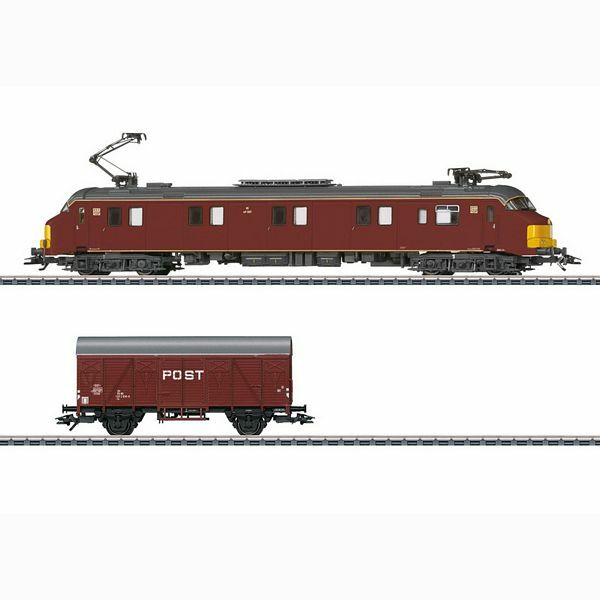 Model: The powered rail car has an mfx digital decoder and extensive sound functions. It also has controlled high-efficiency propulsion. 2 axles powered. Traction tires. The triple headlights and dual red marker lights change over with the direction of travel, will work in conventional operation, and can be controlled digitally. The powered rail car has factory-installed interior lighting. The headlights are maintenance-free warm white LEDs and the marker lights are maintenance-free red LEDs. Compressed air hoses are included and can be mounted on the buffer beam. The car has separately applied metal grab irons and other details. The boxcar has close couplers with a guide mechanism. Total length over the buffers about 39.0 cm / 15-3/8". The PTT powered rail cars had been used since 1965 in express postal service on the Dutch State Railways (NS). With an empty weight of 52 metric tons, these units can transport 15 metric tons of mail. In order to increase the load capacity postal boxcars are coupled to the powered rail cars as needed. This unit reaches a maximum speed of 140 km/h / 87.5 mph with its four powerful motors, each at 236 horsepower.